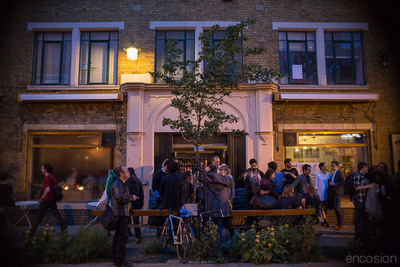 Those who managed to catch a previous article on the delights of Dalston may recall a mention of a certain venue called Café Oto. A jewel in London's experimental music scene, with its mixture of free jazz, avant-rock, folk, and abstract electronica, this staunchly independent venue has become a huge success since opening five years ago. An Anglo-Japanese venture ("Oto" means "sound" or "noise" in Japanese), it's sparsely-lit interior takes you into an alternative world of music that has become a by-word for, in their own words, "providing a home for creative new music that exists outside the mainstream." Most of the acts will be wilfully obscure to many, but they have hosted some big names, including Sonic Youth's Thurston Moore and Kim Gordon, The Sun Ra Arkestra (who have a Christmas residency most years), Terry Riley, Yoko Ono, bonkers Japanese space-rockers Acid Mothers Temple, and British jazz legend Evan Parker. at an impressive 11.3%; needless to say your writer felt duty bound to try a bottle of the stuff, and promptly found himself slurring many words afterwards. Open as a Café from 9:30am to 5:30pm (after which the venue closes for soundcheck, before reopening in the evening for concerts and talks, most of which charge an entry fee), the place can be a delight in the day. Located on Ashwin Street, a strip hid away from the hustle and bustle of Kingsland High Street due to seemingly never-ending building works on a large patch of land, the Café sits right between the similarly independent-minded and creative Arcola Theatre and Dalston Print House venues with seats inside and outside while you enjoy their coffee. The whole vibe feels very pleasant and relaxing. Food-wise, meanwhile, a particular recommendation is a 'residency' by Soli Zardosht in the café on Friday-Sunday (12pm-4pm), an Anglo-Iranian cook who serves some gorgeous Persian food (such as the hummus and bread dish in the picture below that your writer can vow was truly tasty), with fragrant stews and salads being a speciality. Zardosht also runs a stall on Broadway Market the rest of the time serving the same wares. On other days, meanwhile, and capitalising on the Ango-Japanese theme of the venue, the Café serves pastries (courtesy of The Little Bread Pedlar) alongside Japanese snacks (as well as Japanese Sake and Shochu beer). In short, the venue is a jewel in the middle of Hackney, and well needed at a time when many other alternative arts spaces in London (The Foundry and City and Arts Music Project to give just two examples) have closed down. Café Oto remains a beacon of individualism in a slowly engulfing sea of homogenisation.